Can be built on grass or concrete / tarmac ground. All timber is locally sourced and FSC. Timber is preservative treated. 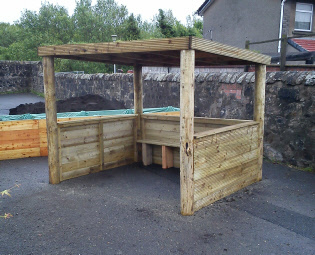 This example is 2m x 2m x 1.8m in height, simple bench seat at rear of shelter. Timber is preservative treated but can be painted. The flooring is painted with a non-slip coating. This example is just over 4m in length, 2m in width. The cost of this boat is £1195.00 inclusive. Play boats can be made to a size that suits your requirement and can be built on grass or solid surface. The internal area can also be made with raised sections. A variety of options available such as a ‘steering wheel’ ‘anchor’ or name badge if required. 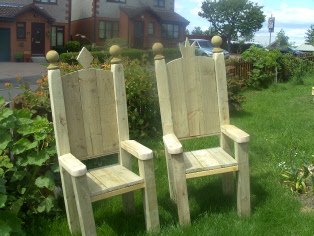 We can make many styles of outdoor seating, from simple robust log bench seats to ‘throne’ chairs as pictured. We can make outdoor homes for many animals/pets. 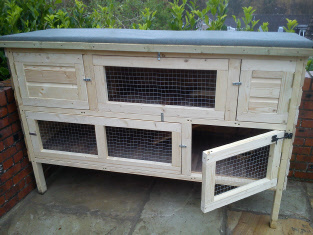 Pictured is a hutch suitable for two or three rabbits. The upper area of this hutch has insulated floor, sides and roof. Flooring throughout is non-porous. Grilled panels can be lifted out to enable easier cleaning. All timber used is treated but can be stained in a colour of your choice. We consult with animal welfare organisations when constructing any shelter/home. Animal homes are made to order only. Work towards meeting green flag or Eco status and positive recycling. A great project that everyone can be involved in! Collecting and sorting the bottles to building the greenhouse itself. 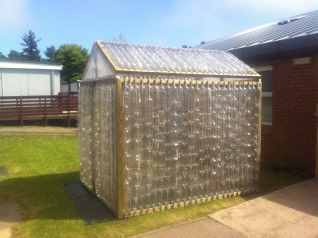 Re-use those empty plastic bottles to create a valuable resource for the gardeners! 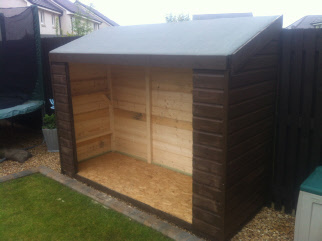 We build sheds and shelters to the exact sizes to meet your needs. All timber is locally sourced and FSC. It is pretreated but can be stained to a colour of your choice. We can build decked areas to meet exactly your garden needs. 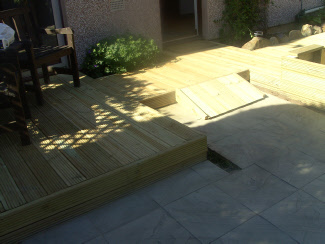 Decking provides a practical natural alternative when wanting to transform your garden. 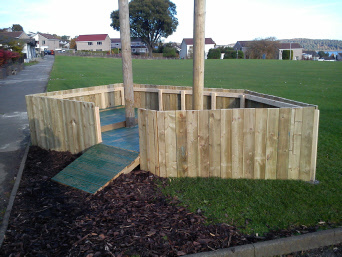 Can be used to create a patio area or pathways. All timber is locally sourced and FSC. Decking is pre treated and can be stained with a colour of your choice. 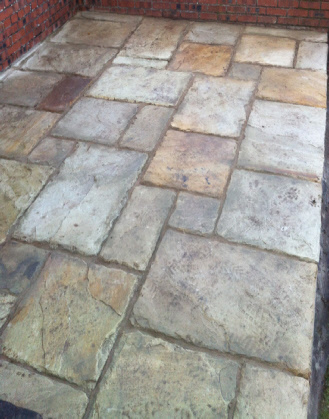 Whether using natural stone or decorative concrete paving slabs, we can create a patio of any size or style. Make your garden space into an outside room - perfect for enjoying our glorious summers!! This is just a small selection of some of the items we make, whatever you have in mind why not send an email and we will be happy to provide a competitive quote for your needs.